His Hands Extended has grown since its inception from traveling to Seattle to feed and clothe the homeless, starting out at a shelter near the waterfront to serving homeless people under the viaduct, then onto Compass Center at 3rd & Virginia St., then finally, in May 2014, Peter’s Place, a 48 bed overnight shelter, opened in the SoDo district. We meet the second and fourth Wednesday of the month for sandwich making at 11:00 am in the Trinity kitchen. We then travel to Seattle the second and fourth Thursday of the month to Seattle. After feeding and clothing the residents at Peter’s Place, whatever clothing is left over is dropped off at a Nickelsville encampment nearby. HHE also provides clothing for Everett Gospel Mission and a Women’s Shelter also located in Everett. This past year your generous donations of food, clothing and bedding have helped countless homeless people. Our volunteers prepare approximately 300 sandwiches monthly, and in the cold winter months we also provide homemade soup. We have been able to provide earthenware dishes and flatware, and our quilters donated about 35 quilts. We were also able to purchase a sound system for Peter’s Place, which is used by the staff to relay vital information to the folks in the center. Unfortunately there are so many homeless men, women and children in Seattle. 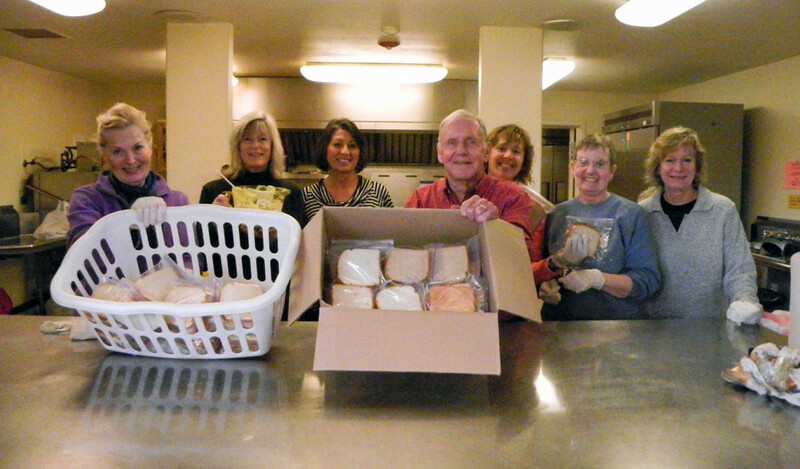 But thanks to Trinity Lutheran Homeless Ministry, along with South Whidbey Assembly of God, we are able to bring some much needed nourishment, comfort, and the word of God to 200 or more people per month. Our volunteers with HHE pray for your continued donations in the future, we could not provide for so many needy people without your help! VOLUNTEER! Join us on a trip to Seattle or help out with sandwich making!